Henrietta Barnett, who lived at Hampstead’s North End, had witnessed the effect of the arrival of the railway in other parts of London and did not like the result – monotonous streets of middle-class housing laid out with little attempt to preserve any of the existing landscape, produce distinctive individual designs or provide homes for a variety of social classes, as a pre-existing village might have done. A handful of pioneering settle­ments had shown that things could be done better, like Rowntree’s village for its workers at New Earswick near York and London’s co-operat­ively created Bedford Park, although each of these was socially uniform in its own way. Faced with the impending arrival of the under­ground railway at Golders Green, Dame Henrietta set up the Hampstead Garden Suburb Trust in 1906 and with the support of her influ­ential contacts and the London County Council acquired the freehold on 243 acres of Eton College’s land at Wylde’s Farm. Parliament passed a special act to waive Hendon’s building regula­tions so that some of the roads might be quaintly narrow and houses of varying heights could sometimes be grouped together without the need for party walls to project above the roofline. The suburb was planned and built in several phases, beginning with an ‘artisans’ quarter’ extending to the east side of the Finchley Road at Temple Fortune. A central square was laid out at the suburb’s highest point, with churches and communal buildings. More popular attrac­tions like a pub, cinema or even shops were not permitted – and are still not – which has impaired the square’s potential to act as a community hub. Nearer the extension to Hampstead Heath (which Dame Henrietta had earlier success­fully campaigned to create) grander houses were built to help generate revenue for the whole scheme. The trust acquired additional parcels of land before the First World War and these were mostly developed after the war by co-partners, who built commer­cially but had to follow strict guidelines. 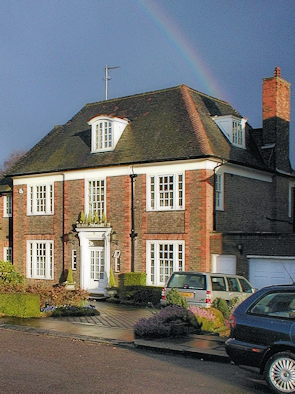 Raymond Unwin became the suburb’s principal architect after the dismissal of the Italianate-inclined Edwin Lutyens, but many other practices played a part and all worked to the same harmo­nious ends. A vernacular Arts and Crafts style permeated the earlier phases, giving way to neo-Georgian when profit became the primary motiv­ation. Hampstead Garden Suburb was intended as a utopian haven for Londoners of all classes but the typical resident is now likely to be white, married, middle-aged and university-educated. The suburb’s signi­ficant Jewish minority (38 per cent at the 2011 census – the highest such proportion in London) provides the only evidence of diversity. However, to give these uniformly middle-class people credit, many of them exhibit a community spirit lacking in other parts of London. When Barnet council withdrew funding from the Market Place library in April 2012, more than 70 residents volun­teered for staffing duty and within a few days it was reopened (by local resident Jonathan Ross) as a community library. Volunteers also run the Garden Suburb Gallery at Fellowship House on Willifield Way, as well as organ­ising numerous events. The artist William Ratcliffe, a fringe member of the Camden Town Group, lived here and his painting of the suburb is in the possession of Tate Britain. 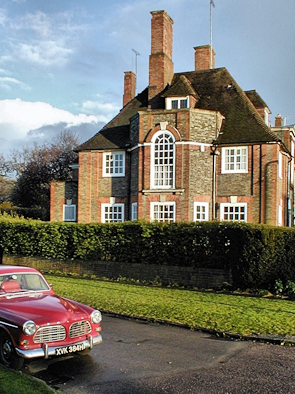 The actress Elizabeth Taylor grew up at 8 Wildwood Road.